Chart Wealth... CBOE GSTI Hardware Index Drives Higher! January 2007, Volume 4 Issue 1 Know It - Profit! This month, computer hardware is making a come back. Find out which disc technology stock is ready to drive higher. And... did you think we would be setting record highs a year ago? Remember the chart of the Dow which ran in Market Metrics back in April 2006? We'll re-visit that chart, later. All the broad market indices finished the year in positive territory. The Russell 2000 (^RUT) was up the most... tacking on a 15.2% gain. 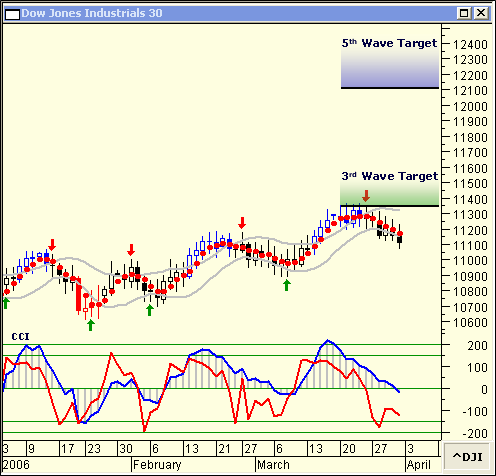 The Dow Jones Industrials (^DJI) gained a healthy 14.9%. The Wilshire 5000 (^DWC) and Standard & Poor's 500 (^GSPC) were up 12.1% and 11.8%, respectively. Finally, the Nasdaq Composite (^IXIC) managed to eke-out a modest 7.7% gain. This month's leading sectors is a mixed bag. The AMEX Airline Index (^XAL) got some wind beneath its wings... up 18.1% for the quarter. The CBOE GSTI Hardware Index (^GHA) and the PHLX SIG Steel Producer Index (^STQ) were both up a respectable 16.5%. Also, the CBOE GSTI Internet Index (^GIN) gained 13.9% for the quarter. And, the AMEX Gold Bugs Index (^HUI) is shining... up 12.6% over the last three months. Seagate Technology (STX) designs, manufactures and markets disc storage drives for enterprise, desktop and consumer electronics. STX was up over 14% during the last quarter. 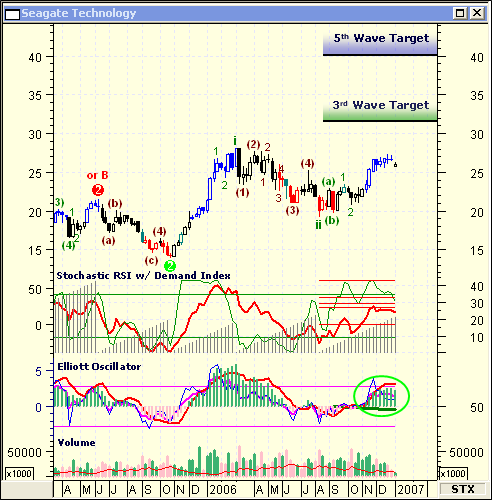 The weekly chart shows STX in the middle of a third Elliott wave up which began in August 2006. The volume has tapered-off significantly as the stock nears a minor third wave top. However, the Elliott Oscillator remains bullish... forecasting more upside potential. 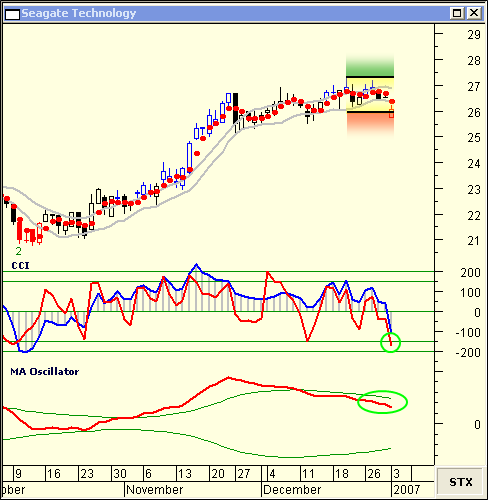 The daily chart of Seagate Technology (STX) shows the short-term CCI has bottomed-out and the stock will likely turn up, again. However, if the CCI dips into negative territory for more than six days in a row, look for the stock to trade sideways to lower. For the time being, the MA Oscillator shows the bullish trend will continue. If it moves below zero and through the lower band... watch out - the stock will definitely be headed lower. Another positive sign is the moving average channel has contained the price action as the stock moves sideways. Multiple closes below the channel, however, would tip the stock to the bears' favor. Look for STX to trade above $27... trading to a final price target near $40. I hope this coming year will bring you great success in the markets. Now is the time to re-evaluate your portfolios and make any appropriate changes based on sound technical analysis.